Firmware version QTS 4.3.3.0154 was loaded onto the TS-431X and performance tests were run using the Revision 5 NAS test process. All tests were run using Western Digital Red 1 TB (WD10EFRX) (x4 SNB supplied). The Intel X540-T2 card we've used for previous 10 GbE review supports 10GBASE-T (copper) connections only. So a 10Gtek x520DAI card was installed in the NAS test bed machine. The same Intel 3.9.58.9101 Windows driver used by the Intel card worked just fine with the 10Gtek. Since the NAS doesn't ship with a 10 GbE SFP+ cable, we used a Cable Matters 3m SFP+ cable to hook things up. We're going to focus on the TS-431X' 10 GbE performance. As we've pointed out in many reviews, most of today's NASes can saturate a single Gigabit Ethernet connection when transferring large sequential files and the TS-431X is no exception. That's why the NAS Charts have so many products with 109 / 110 MB/s File Copy results. If you want to break the 1 gigabit barrier, you need to use multiple clients, enable link aggregation on the NAS ports and connect through a switch that also supports link aggregation. Or you need to move to 10 GbE. Although 10 GbE will cost more for both NAS and client, this method supports higher throughput with a single client with no link aggregation required. To get a feel for how the seven 10 GbE products in our charts compared, I created a chart for 10 GbE RAID 5 File Copy Write and 10 GbE RAID 5 File Copy read. For File Copy Write, the TS-431X-2G was surprisingly just slightly faster than the TS-563-8G. For File Copy Read, the QNAP TS-563-8G outperformed all other NASes by a significant amount, while the TS-431X-2G was the slowest of the batch. Still, 326.9 MB/s is more than three times the throughput achievable with Gigabit Ethernet. The benchmark summary composite chart below shows only the 10 GbE test results run using a single 10 GbE client. If you want to see the complete results including the Gigabit Ethernet tests, you can click here for the TS-431X-2G or here for the TS-563-8G. Looking at the chart, you can see that for File Copy Write performance, both of the NASes turned in very similar results for all RAID levels. But for File Copy Read, the TS563-8X has the highest throughput we've seen. In general, the TS-563-8G outperformed the TS431X-2G with a couple of exceptions. For the RAID 5 10 GbE NASPT File Copy To NAS and File Copy From NAS tests, the TS-431X-2G outperformed the TS-563-8G. Prior to this review, the NAS Ranker did not take into account 10 GbE performance and ranked products only using gigabit benchmarks. The NAS Ranker has now been changed to include 10 GbE benchmarks in the ranking calculation. So we have moved all 10 GbE capable products to a new RAID 5 - 10 GbE class. You can also view sub-ranking for both gigabit and 10 GbE benchmarks. The image below shows the new class and rankings for the NAS Ranker. So let's take the NAS Ranker's new 10 GbE features for a spin. Since there are only seven NASes that have been tested with 10 GbE so far, I decided to leave the results sorted by Rank. 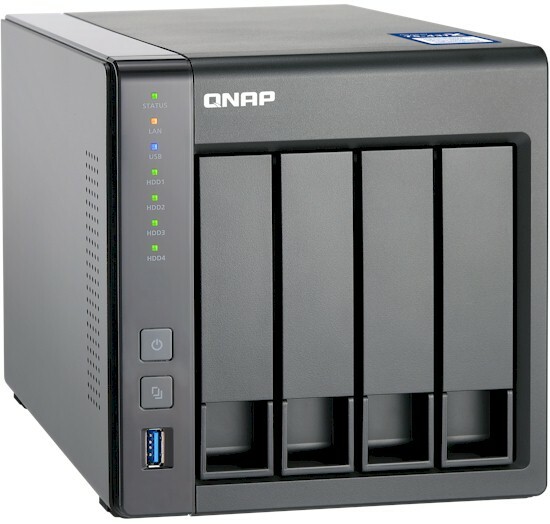 The NAS Ranker shows that based on performance, the QNAP TS-431X-2G ranks #4 against some very pricey competition. Turning to the Ranker Performance Summary, you'll find there's lots of data in the composite chart below. Looking first at the Gigabit Ethernet results near the top of the chart, the TS-431X-2G tied with the TS-563-8G for Read Benchmarks and iSCSI categories, and actually outperformed the TD-563-8G for Mixed Read Write, Video, and backup categories. Just to reiterate, these rankings are only for the seven products currently in the RAID5 - 10 GbE class. For the 10 GbE category rankings, the TS-563-8G had clear category wins over the TS-431X-2G in the Read Benchmark category (#1 vs #4) and the Mixed Read Write category (#2 vs. #5). For all other categories, the TS-431X-2G ranked only one rank behind the TS-563-8G. The TS-431X is an interesting product targeted at the entry level SMB market, yet it offers a significant amount of performance. The built-in 10 GbE SFP+ port offers performance beyond what link-aggregated dual Gigabit NASes can offer. And it gives significantly more expensive 10 GbE-capable NASes a run for their money from a performance perspective. At its current price around $350, it is an incredible value. The TS-431X is not directly comparable to many much more expensive 10 GbE-tested NASes. It only has four bays and only a single 10 GbE port. The TS-563-8G has five bays, so potentially, you could have more storage capacity than on a four-bay NAS or a live spare. But at around $700, it does not come with built-in 10 GbE port. A single port PCIe 10 GbE SFP+ compatible card will set you back another $170. Even if you don't plan to use the TS431X's 10 GbE capabilities, the TS-431X offers excellent performance as a Gigabit Ethernet NAS, running neck-and-neck with the #5 ranked RAID 5 TS-431P, as well as the #3-ranked Synology DS416. Whether you plan to use 10 GbE, want to future proof by buying a NAS with 10 GbE capabilities, or are just looking for a four-bay value-packed NAS to use on your Gigabit network, the TS-431X-2G would be a difficult NAS to pass up.